Aging – a nightmare isn’t it? Particularly in the current era, where the world is polluted enough, coupled with the changes in our food habits, there are numerous problems and changes that our lifestyle is going through. 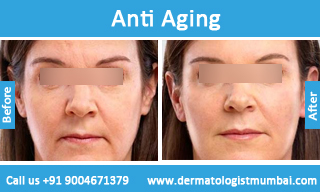 It is important to stay healthy and fight against aging problems like dry skin, sagging, wrinkles, skin elasticity, etc.. As days roll, it is vital to get yourself an appointment with an anti-aging treatment clinic to avoid anything major hitting you hard later. Ensure to live a stress-free life coupled with physical exercises and good diet, and it is also a good idea to check in any of the anti aging treatment clinic so that one could avoid any cosmetic treatments or surgery in the future. How ‘Aging’ Works? And What Are The Causes? First comes first, aging is a natural process, and indeed every individual goes through the same one day or the other. 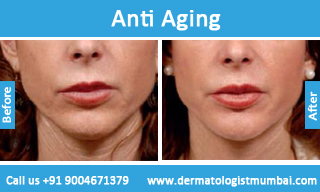 Aging is due to the depletion of the stem cells which makes up to the skin and bones in our body. As the stem cells deplete, we start aging. Not to worry, there is anti aging treatment clinic to help one get through these issues at the best. The treatments would help in providing the body with its vitality and gives the face the necessary glow. At anti aging treatment clinic, they take skin tests and stimulate new stem cells to the body to stop or slow down the aging process. For an individual to stay healthy and sport young skin, they will have to maintain their epidermal stem cells which by itself have self-generating property, generating the daughter cells. With the newly formed daughter cells, the skin is refined, and new skin is made by our body. Other than just repairing the skin, these epidermal cells also maintain the health of tissues for the vital organs like heart and liver. However, this stem cell mobilization becomes impaired due to the resistance from diseases. Due to these, the level of cells that remain to maintain one’s skin vitality is low. So, What Are The Treatments Available? The non-surgical treatments include Chemical Peels, where the medicinal solutions are applied to peel the damaged skin reveal fresh layer. Mesotherapy – a combination of minerals, vitamins and amino acids are applied on the normal skin rejuvenating it. Microdermabrasion – removing uppermost layer of the skin through exfoliant crystal spray. One has to visit an anti-aging treatment clinic and get the test done where the doctor suggests the right method. Laser And Light Treatments – There are different kinds of light treatments that are available at various anti-aging treatment clinic – Intense pulse light is one in which light rays are passed on the patient’s skin, there are other techniques that are also non-surgical facelift options that can be done using ultrasonic devices like ULTHERA which is just a 2 sessions and a one-time per year session which reduces the number of visits to the clinics. BOTOX – known as the Botulinum toxin injections and Hyaluronic/collagen fillers are the most used and very well known that corrects wrinkles on the skin. Only in the later stages, any doctor for an anti-aging treatment clinic would suggest for a surgical procedure. These include facelift, platysmaplasty – to tighten the sagging skin, blepharoplasty – for eye bags and implants to add flesh to chin and cheeks. Ultherapy – This is a modern, non-surgical face lifting procedure that uses sound waves to rejuvenate the skin. There are only a handful of centres in India that has this procedure available, Dr. Rinky Kapoor’s Esthetic Clinic being one of them. So visit her when you think anti aging treatment Mumbai. Fillers – With age the face loses volume and a youthful shape. In this technique the cosmetic surgeon injects fillers into the face strategically. This restores the shape of the face and negates the tired and sunken appearance. There are a few procedures to be followed religiously for long lasting results. These procedures would be listed by a dermatologist. Age is just a number; there are good treatments to slow down aging. Ensure to follow a proper diet, be active physically, and consult a dermatologist before attempting any treatments. Traditional creams on the market work but do not achieve as good results as these procedures will. 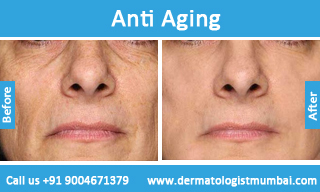 There are some other alternative procedures that reduce wrinkles and contribute towards anti-aging treatment. Facial toning is one such procedure that aims to alter the contours of the face by actual physical therapy. This is done by engaging the patient in facial exercises that encourages muscular toning in the face. 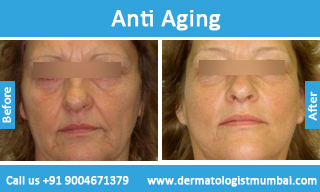 This ensures that there is no muscle loss in the face, thereby reducing the wrinkles and sagging due to aging. Another alternative anti-aging treatment that is popular in Mumbai is electro-stimulation. This involves passing low levels of electric current through the face which results in toning of the facial muscles. 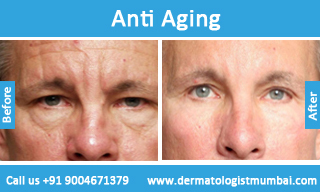 This too is practised by quite a few centres in India but is not very widely used for anti-aging. If the aging process is getting you down, then choosing the best anti aging treatment clinic will give you your mojo back! A good anti aging treatment clinic in your city, like The Esthetic Clinics in Mumbai, will not only have the best anti aging treatments on offer, the clinic will also help you deal with the aging process better. Finding the best anti aging treatment clinic won’t be easy because there will be many to choose from. But remember that the best anti aging treatment clinic will be one which is highly recommended by friends and acquaintances. 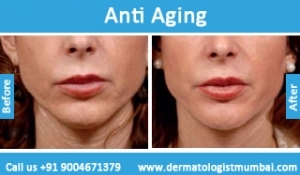 So to find a good anti aging treatment clinic, make sure to ask around. A good anti aging treatment clinic is not only one that will have the best dermatologist like Dr. Rinky Kapoor at The Esthetic Clinics, but it should also have the best anti aging treatments on offer. 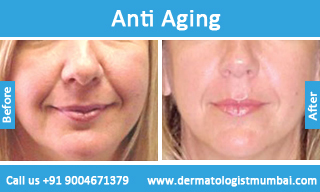 Choose an anti aging treatment clinic that has the best technologies under the roof and you will not regret it. The clinic should be a professional place. Also, the clinic should have a solid client base and be reputed. We at The Esthetic Clinic take utmost care of all our patients, and always strive to provide the best services at reasonable prices. Patients can avail services of a cosmetic dermatologist as well as a facial plastic surgeon , as per requirement, who work in tandem to determine the best suitable treatment for any individual. With the help of state-of-art equipments and facilities our highly experienced and qualified dermatologists and cosmetologists can provide excellent treatments. 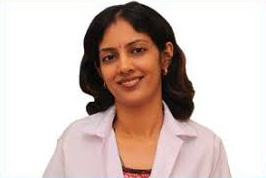 The co-founder, Dr. Rinky Kapoor ,is a top dermato-surgeon, cosmetic dermatologist, and a skin laser specialist, Dermatologist in Mumbai. Having trained at Stanford University and National Skin Center (Singapore),she has the rare experience in treating Asian as well as Caucasian skin types. You can easily book an appointment using the form available on our website or call the numbers mentioned.